Celebrated Indian choreographer Aditi Mangaldas makes a welcome return to the stage with her new show INTER_UPTED, a high-octane piece which explores human vulnerability. Performed by three musicians and seven dancers including Mangaldas, INTER_UPTED infuses the classical Indian form Kathak with 21st century sound, rhythm and light. The 55 minute dance piece explores the fragility, disintegration and renewal of the body by combining gentle imagery with explosive rhythms. 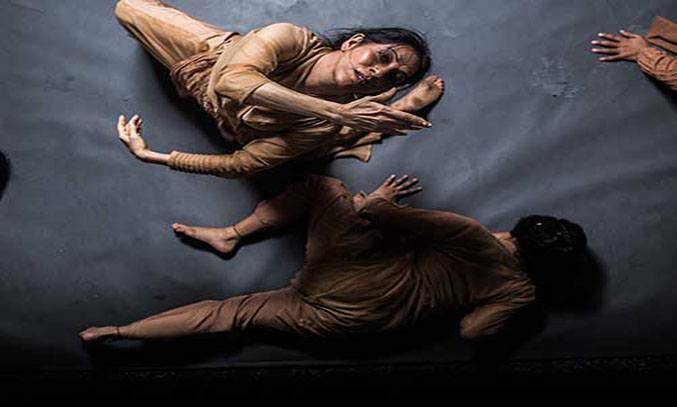 Since 2005, Aditi Mangaldas has consistently broken ground with her visionary merging of classic and contemporary Indian dance styles and INTER_UPTED is no exception. This eloquent and dynamic piece takes the classical traditions of Kathak and gives it a fascinating modern edge by placing music and movement within a contemporary context. The uninterrupted dance piece is sub-divided into eight sequences. The striking open sequence in which a male dancer shivers with increasing convulsions sets the narrative for the piece. Slow and silent contemporary solo pieces follow, building into fast-paced, high energy Kathak numbers that see the dancers stamp out the rhythms with their bare feet and spin around in relentless fast cycles. Fabiana Piccioli’s striking and versatile lighting design perfectly complements the piece, playing on shadow and silhouette. The spotlights and shadows embellish the dancers’ intricate movements and percussive footwork while the simple yet striking set design emphasises the elements of disintegration and uncertainty. Music comes in the form of pre-recorded pieces and explosive beats from drummers Mohit and Ashish Gangani, who provide some brilliant live melodious rhythms, as well as traditional vocabulary. While INTER_UPTED is undoubtedly a startling rich and intricate piece, some of the sequences are a little too lengthy, resulting in the piece losing some of its momentum. The narrative also isn’t always clear at times. A section in the middle is one example of this as Mangaldas begins to clap out a beat and it’s unclear whether she wants the audience to also join her. That said, where it works, it works well and there are some wonderful, evocative sequences. A beautiful solo piece by a female dancer in which she rotates in dizzing spins to a haunting acapella by a singer live on stage particularly stands out, as does another sequence towards the end in which the body of the younger dancer appears to absorb into Mangaldas, her hair becoming Mangaldas’s hair. While INTER_UPTED’s abstract style may not appeal to everyone, overall this is a wonderful transformative piece that questions the deteriorating reliability of our bodies. INTER_UPTED played at The Lowry on 25 October and tours nationally until 30 October.